A young kid named Davey begins to suspect his police officer neighbor is responsible for the recent rash of missing children in their state. Now, Davey and his friends do some investigating and look for evidence to prove that he's right. Take the basic story of "Rear Window" and combine it when the premise of "The Goonies" and you've got "Summer of 84." This film is directed by François Simard, Anouk Whissell, and Yoann-Karl Whissell, the team responsible for the wonderful, retro-post-apocalyptic flick "Turbo Kid." It is written by Matt Leslie and Stephen J. Smith and is the debut screenplay for both of them. 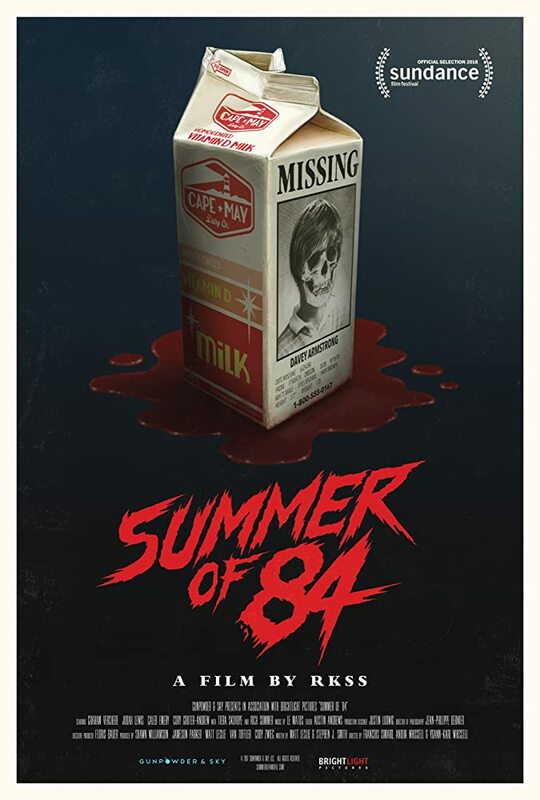 In the summer of 1984, a small suburban town in Oregon starts to live in fear when a serial kidnapper/killer has been nabbing kids in the neighborhood. A boy named Davey Armstrong (Graham Verchere) has seen some things that make him think his police officer neighbor Mr. Mackey (Rich Sommer) is the perpetrator of these atrocities. Davey convinces his friends Eats (Judah Lewis), Woody (Caleb Emery), and Farraday (Cory Grunter-Andrew) to help him investigate his neighbor so they can look for evidence that can connect him to the crimes. Anouk Whissell, Yoan-Karl Whissell, and François Simard have clearly found their niche in 80's-inspired cinema. Much like "Turbo Kid," "Summer of '84" takes inspiration from many movies that came before it and takes full advantage of the ongoing fascination modern movie-goers and television watchers seem to have with the 1980's. We easily drew comparisons between this film and movies like the new version of "It" and the Netflix hit series "Stranger Things." Though "Summer of 84" is marketed as a horror flick, it's more of a crime-drama adventure mystery. We don't really see any horror-type elements until the final portion of the film. It's in these precious few moments where the whole thing falls into a bit of a cliche horror mess. The rest of the film, however, is a much more methodically paced mystery that has the audience second-guessing themselves. We found ourselves wondering if Davey is right about his neighbor being the killer, but we are also led to believe that Davey is just imagining things and looking for connections that aren't actually there. The "is he or isn't he?" element of the story is compelling and worked for us for most of the time. There are many effectively tense moments that kept us on the edge of our seats. The reason we're able to get so invested in this story is that all of the young actors do a marvelous job in their roles. We can't wait to see what each of them does next because they are fantastic here. Despite its cliche ending, we had a solid viewing experience watching "Summer of 84." The pacing can be a little slow, and things ultimately get dragged out a little longer than they needed to be, but if you enjoy movies like "Stand By Me" or "Super 8," you can't go wrong with this one.